يوفر فندق Discovery Parks - Pambula Beach ظروف إقامة راقية وهو خيار رائج للسياح ولرجال الأعمال أيضاً. يقع في منطقة شواطئ من المدينة. يسهل الوصول إلى هذا الفندق ذو 3.5 نجوم من المطار، فهو يبعد عنه مسافة 6km فقط. يشكل هذا الفندق ملاذاَ مريحاً للاسترخاء ويمنح زواره فرصة للاستجمام والتجدد، وهو يقع على بعد خطوات من المعالم السياحية الكثيرة للمدينة. إن الخدمات الممتازة وحسن الضيافة العالي في Discovery Parks - Pambula Beach تجعل إقامتك تجربة لا تنسى. يمكن للنزلاء الاستمتاع بالميزات التالية: متجر, مرافق مخصصة لذوي الاحتياجات الخاصة, واي فاي في المناطق العامة, صف السيارات, غرفة عائلية أثناء إقامتهم في هذا المكان الرائع. استمتع بوسائل الراحة الراقية في الغرف أثناء إقامتك هنا. بعض الغرف تتضمن تلفزيون بشاشة مسطحة, حوض الاسترخاء, مكيف هواء, تدفئة, شرفة/ تراس لمساعدتك على استعادة طاقتك بعد يوم طويل. سواء كنت من محبي الرياضة أو كنت تتطلع لتفريغ عناء نهار صعب، ستجد خدمات ذات مستوى عالي بانتظارك كمثل مسارات المشي, ملعب مصغر للجولف, حديقة مائية, حوض استحمام ساخن, شاطئ خاص. يشكل Discovery Parks - Pambula Beach بخدماته الراقية وموقعه الممتاز، قاعدة مثالية للاستمتاع بإقامتك في المدينة. This is the second time in 4 weeks we stayed here. We love it and will be back very soon. Rooms are comfortable and clean with full kitchen and bedding stuff provided. Good sized fridge and stove top - good TV reception too and hot water. We have a 14 month old and he loved sleeping on the trundle bed! We had a ball and this was a mega comfy location and even better park. We will be back to spend more time down their soon. We had a great room, with all we needed and just a short walk to the shop and the beach. Great for fishing off the rocks (we got a bag of tailor) and even for surfing I would imagine. 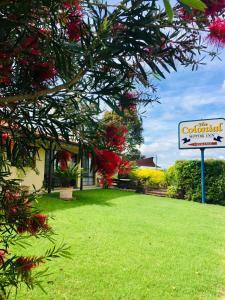 I have been come to Pambula since I was a kid, but this was my best stay so far! We had a very clean and tidy beach cabin. The park is in a beautiful spot, right on the beach, and the facilities are fantastic..... especially if you have kids. good stay in this family park. Cabin we stayed in was clean well stocked, although would be nice if it had an update. Would consider stay again so our little ones can enjoy park facilities more. Great walking distance next to Pambula beach. We stayed for one night on an overnight stopover so took the budget cabin. It was old, pokey and quite uncomfortable and cold, particularly on a 1 degree night. There was a strip heater for the cabin and a blow heater which we couldn't leave on all night. Froze this night but met lovely kangaroo with joey at our front door in the morning. Staff were not particularly helpful. Just gave us the key with no more information. Good facilities. My kid love the water park. We were given a cabin beside the road and it was noisy with people passing by, especially at night. It was a shortstay , had fun , nice place for families. Very nice location easy access to beach. will be back again. Good location, Surrounded with kangaroos, nice experience for the kids. Great, the kids love it. There are so many kangaroos at the surrounding. Nice beach, good view. Die Anlage ist toll gelegen, nah zum Meer und zum Nationalpark, daher hat man häufiger Kängurus zu Besuch. Die Poolanlage und der Spielplatz sind gepflegt und schön. Die Unterkunft an sich war eher mäßig, kleine Kabine mit wenig Platz und keiner kindgerechten Terrasse.